This section contains posts made before the split into state-based forums for photos etc. New posts should be made to the appropriate state forum or the "General/Miscellaneous/Various" forum. TV630 was this fully imported Volvo B58 with Duple coach body of 1974 build. Seen here at the '74 or '75 bus show. TV503 was this Denning Mono GM6V71 of 1972 build. Based at Penrith for most of its time with Bosnjak was JAU 597 this fully imported Bedford YMT3 with Duple coach body of 1978. TV630 with Smithfield coach body I believe may have been a rebodied Volvo chassis. Anybody with info ? Another Volvo coach with Smithfield body on display at the bus show. Any identification for this one from anyone ? Thanks Centralian for the pics. Were all Duple buses imported or were some assembled here? Last edited by Dave Wilson on Sun Dec 23, 2007 12:23 pm, edited 1 time in total. I remember going on a few excursions on this bus (from Edmund Rice College in Wollongong) including one down to the snow. She was from memory a great looking and riding bus. The Horrell's one came from somewhere out Dubbo way. mrobsessed wrote: The Horrell's one came from somewhere out Dubbo way. It came from Jones, Condobolin and after Horrell's sale to John J. Hill, ended up with Shire Coaches. TV630 was one of the first arrivals of Duple Dominant bodies - they were imported already assembled. It was chassis number 5222, regaitered new as TV630 on 26/08/74. The photograph would be from the 1974 Bus and Coach Show at Fairfield Showground. On 26/03/75 at 8.50 pm it was involved in an accident on Gavan Way at Nerang. It was subsequently rebodied by Smithfield as RC45F, being registered 23/12/75 as TV630. 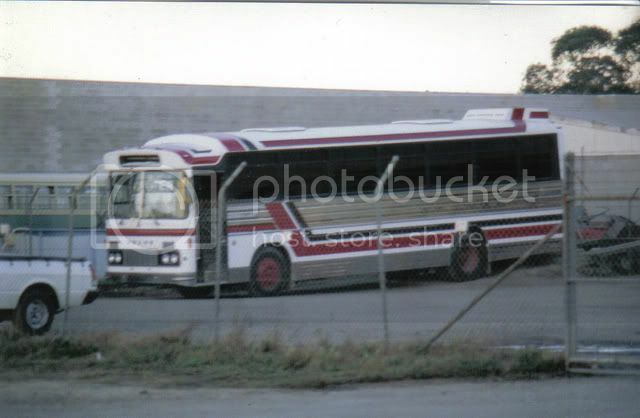 It was sold with the Bosnjaks Coach Tours operation and TV plates to Canberra Cruises and Tours 0n 01/07/80. Thanks for that info VIKing. I suspect therefore that either the last photo above is of the rebodied TV503 Volvo/Duple, or this poor shot I took at Penrith is. I actually suspect that these two shots may be of one and the same vehicle that's had the beige replaced with white, or vice versa. I don't recall Bosnjak's having 2 identical Volvo Euro coaches. In the first photo above of the Duple at the '74 bus show, the grey Duple just seen next to it was the second unit for Bosnjak's which became TV503. You are indeed corect, the Volvo in the 2 photos is the same vehicle (Smithfield SB708) - the second rebody. 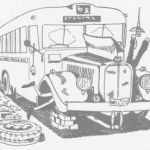 It was regiatered KUW831 and was retained as a charter vehicle by the Bosnjak family when the 6 TV plates and coaches (4 Duples, TV630 the first rebodied Volvo B58 and TV 468 the "Smithfield Monocoach" ) were sold. It was repainted into the white / marron livery around this time. Later reregistered TV753, it was sold to McKay of Gladstone (near Kempsey) as MO 7209. It was converted to a bus (RB53F) and passed with McKays service to Cavanaghs in 12/89. The plate TV 753 then went onto the third of the Volgren B10M twin decks. The first two were TV 827 and 828. All were later re-registered TV 403, 404 and 402. TV 753 was slightly different in that it came with a bunk and different coloured interior. I came across this thread earlier today - it had the old format photo links which I have now corrected - It is worth reactivating the thread to look at these photos from nearly 10 years. There are quote a few of these old threads with dead links and as time permits I will reactivate a few more of them.